Every bride spends years fantasising about her perfect wedding gown, and everything from the style of the dress to its shade plays an important role. 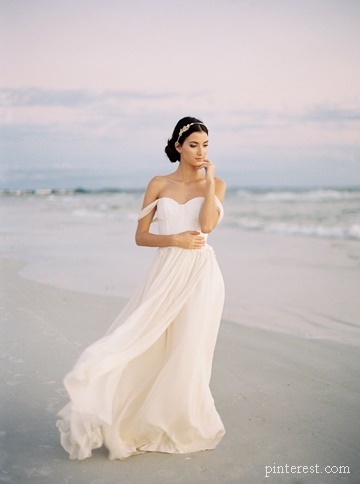 Selecting the right fabric for the dress is also a vital consideration – particularly if you’re tying the knot in a breezy, beach setting like Thailand. 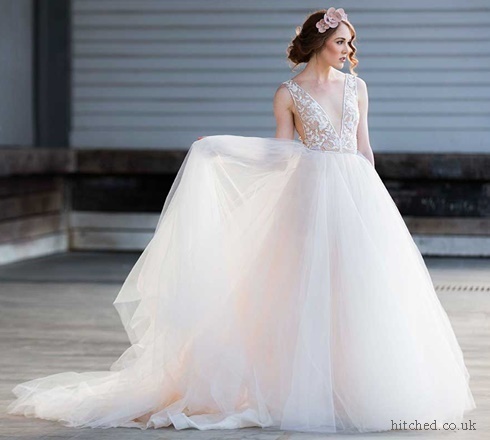 Of course, the style of your frock will dictate the fabric as much as the setting of your wedding, as some materials are better for structured gowns, while others are suited to floaty ballgowns. Feeling even more confused about your dress choice than before? 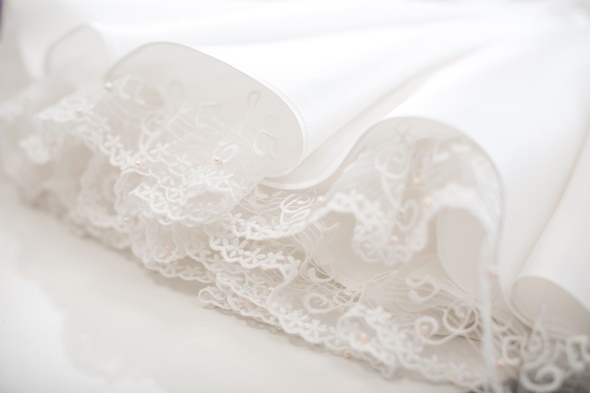 Fear not – we’re here to give you the low down on the five top fabrics used for wedding gowns, and exactly why they’re popular. Many brides across the globe long for a traditional, satin gown. However, it’s important to blow apart the notion that satin is a fabric – it’s actually a finish applied to the material. This means you can have satin that is made from everything from pure silk to a blend between silk and polyester. Satin wins when it comes to versatility – it has a sleek finish with plenty of body, so it’s the ideal choice for more structured wedding gowns. Bear in mind that satin finishes often result in a thicker fabric, ideal for cooler climates – this will be an important consideration if you’re getting married in tropical Thailand. Next up is charmeuse – a gorgeously light, luxurious-looking material with a gleaming glossy sheen. However, charmeuse gowns aren’t for brides who are faint of heart, as the material is particularly unforgiving and will reveal every groove of the skin beneath. Of course, if you’ve been working hard on your wedding day body during the run up to the big day, this might be exactly what you want. Charmeuse is usually made from silk, but it can also be created from synthetic fibres. This slinky choice is typically the go-to choice of brides who want to inject a little bit of sexiness into their wedding day ensemble. If you’re tying the knot in a balmy destination like Thailand, you might be on the lookout for a gown that’s lightweight and cool as tropical temperatures soar. Chiffon could be the ideal solution. Extremely sheer and lightweight, this lightly woven material is layered to create a fantastic floating effect. The extra layers will also create the substantial texture you want from your fabric, whilst still being light enough to dance in the sea breeze. One downside of chiffon is that the texture of the fabric is extremely delicate and could snag easily, so you’ll need your bridesmaids to keep their eyes peeled to ensure your gown doesn’t snag on any shells or pebbles on the beach. For that true ball gown wow factor, tulle is the go-to option. This light, netlike fabric is what a ballerina’s tutu is made from. The sheer nature of the material is great for creating a spectacular effect, and another bonus is that tulle can easily incorporate lace designs so it’s ideal for brides keen to infuse their gowns with a little extra detail. Tulle is the perfect material for creating the princess look, as ruching the layers will give more texture to the dress. However, this is another extremely delicate material, so you’ll need to take care to pack it carefully when you head to Thailand to say your vows. For a truly royal effect, lace is the only way to go. Of course, intricate lace detailing was incorporated into the dress worn by the Duchess of Cambridge to her wedding in 2011, and more recently by her sister Pippa Middleton who tied the knot earlier this year. Lace will infuse your wedding gown with a gentle, graceful allure, and it comes in an impressive array of styles so you can really take your pick and select something that reflects your own sense of style. For example, Chantilly lace is a particularly detailed and open form of lace, featuring a definite border. On the other hand, there’s Alencon lace, which features bold motifs across its surface and a cord trim.